Thisclass will introduce Eternal Life Assembly to you. You will get aglimpse of her history, the statement of faith of the Assemblies of God,what is baptism and why is it important for a Christian to be baptizedand the responsibilities of a baptized member in EL. All new believersand those who wish to be baptized or become active members of our churchmust attend this class. 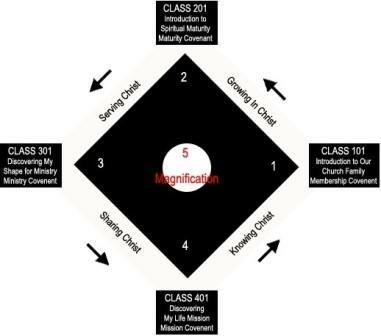 Thisclass will focus on the 4 basic habits that every Christian needs to developin order to grow to spiritual maturity. This class will equip youwith the skills needed to begin these habits and will explain the toolsyou will need to continue them. Thisclass will focus on what the Bible says about ministry; help you discoveryour SHAPE for ministry, ministry opportunities in our church and how youcan be involved. Thiscourse will examine the cultural, social, historical and geographical backgroundof the Bible so that you can understand them better. Questions relatingto its authority and infallibility will be discussed. Basic guidelinesfor interpreting the Bible will also be taught. Thisseminar will help you discover your personal temperament, your personalstyle of working; enhance your communication and personal relationships.It will also help you be an effective team player. Thiscourse will show from the Bible the truth about spiritual warfare and howto be victorious in Christ. It will reveal God’s teaching about thespirit world and gives you principles of prayer. Thisclass you will discover your life mission, learn how to share the Messageeffectively, the keys to spiritual fishing and how to become a world classChristian. You will learn of the church’s missions program and howyou can be apart of it. Thiscourse will cover a broad overview of the entire Bible. You willunderstand God’s dealings with mankind throughout history and the key truthsin each book of the Bible. Thiscourse will briefly explain the basic doctrines of the Assemblies of God. Topics include: Man, Sin, Salvation, God, Jesus Christ and the Holy Spirit. Thisseminar teaches you the 5 Purposes of God and how to live a Purpose DrivenLife. It also challenges you to fulfill them as you know the reasonfor your existence on earth. Thiscourse will briefly explain the rest of the basic doctrines of the Assembliesof God: the Church, the World, the Spirit World, the End Times and Relationships. Thiscourse will give you a better understanding of God’s will in your worldand personal life. It will teach you basic guidelines in findingGod have a will and enable you to live freely and boldly in Christ. Thisseminar will help you understand that God has provided a way for everyoneto be involved in Church. We can be dream releasers, we can giveour life, we can serve with joy and we should work as a team. Thisseminar explains the concept of Community Penetration in the church andhow you can be involved in reaching the community for Christ.